To assess the factors associated with risk of haemoconcentration at delivery, such as initial haemoglobin levels and alterations in the HFE gene, and its effect on low birth weight in pregnant women supplemented with moderate doses of iron. 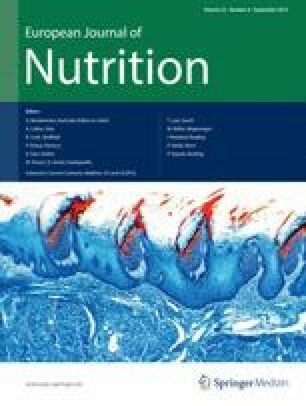 Case–control study nested in a longitudinal study conducted on 217 healthy pregnant women taking moderate iron supplementation and their newborns. Women were classified according to the risk of haemoconcentration at delivery, defined as Hb > 130 g/L. Each subject’s obstetric and clinical history, smoking habit, and iron biochemical parameters (haemoglobin (Hb), serum ferritin and transferrin saturation) were recorded at 1st, 2nd and 3rd trimester and at delivery. Polymorphisms of the HFE gene (C282Y, H63D and S65C) were also measured. The average of iron supplementation of all the women was 43.9 mg/dia (geometric mean, 95 % CI: 43.6–44.1). Higher levels of Hb at early gestation and the presence of HFE mutations were associated with greater risk of haemoconcentration at delivery, adjusted odds ratios of 1.14 (95 % CI: 1.05–1.25) and 5.35 (95 % CI: 1.6–17.8). Haemoconcentration at delivery was associated with a greater risk of low birth weight, adjusted odd ratio of 11.48 (95 % CI: 1.13–116.6). Moderate daily doses of supplementary iron may be harmful for foetal growth in women with alterations in HFE gene and who started pregnancy with good haemoglobin levels. Overall, this suggests the importance of determining a woman’s iron status early in her pregnancy in order to establish a more appropriate pattern of supplementation. This study was financially supported by a grant from the Instituto de Salud Carlos III, Fondo de investigación Sanitaria, Ministerio de Sanidad y Consumo, Madrid, Spain (PI052462). We thank the Clinical Chemistry Laboratories of the Hospital Sant Joan de Reus (Catalunya, Spain) for help with the blood analyses. Thanks to Phil Hoddy (Reus, Spain) for correcting the English text.